How is the treatment done?? 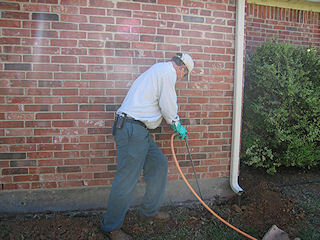 Your termite technician will use a combination of wall foaming, trenching and drilling in order to protect your home. He will inject the drill holes and fill the trenches with the best termite product available. As the soil absorbs the product (our products bond tighter to the soil than others providing longer protection) the treated zone is created. Why treating wood or mud tubes does not work! Termites live underground and probe blindly through the soil looking for food (most cases wood). When they discover your home or building they are very persistent and find ways to get back to or stay in your home. Just like ants find your sugar bowl if you move it from one counter to the other. Termites can build a mud tube at the rate of 1 inch per hour. If you destroy the tube (breaking it off or spraying pesticides) they may build it back or they may find a better entrance to your home. If they find a better entrance and that entrance is out of sight, you may think your problem is gone. In reality, you still have termites. The same concept applies to treating the wood. While this is possible and may eliminate the termites in that area, they more likely will find other wood to eat. Treating the soil under your home is the most effective way to eliminate Subterranean Termites. 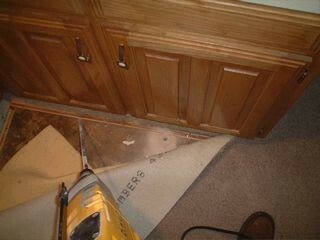 Here we pulled back the carpet and drilled around the wet bar area. Drilling or wall foaming is required around plumbing areas because the pipes provide access through your foundation and moisture. Termite product will be applied to the soil using this hole. Not treating all plumbing areas would be a mistake. After the termite product is applied to the soil under your foundation using these holes, they are then plugged and sealed. The area is now fully protected from termites. 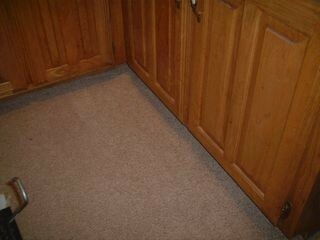 The carpet is tacked back to the floor and the area is cleaned. 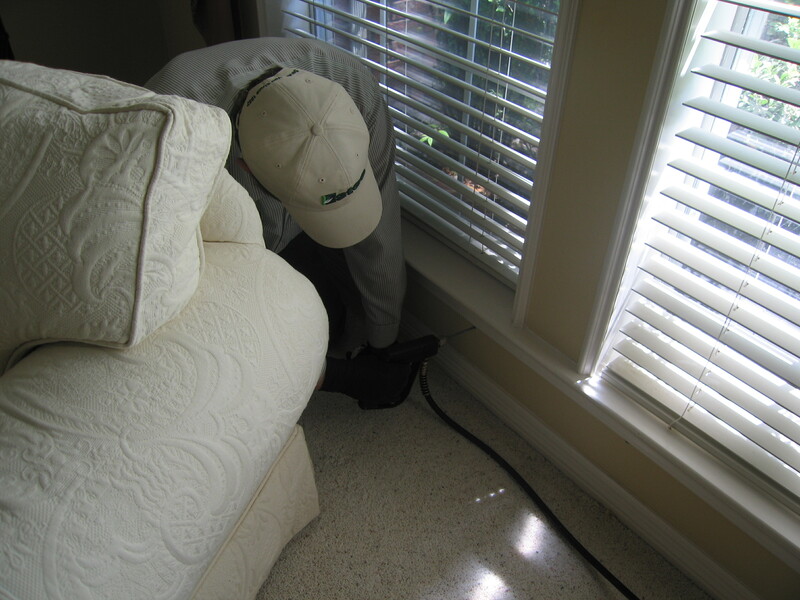 We try to disturb your home as little as possible and we keep our work areas clean. We are using foam around the windows here. The foam will expand inside the wall void and protect these windows from termites and ants. Foaming equipment is one of serveral tools we use to provide the best termite protection. Here we are treating the soil under the foundation at the side of the home. Each trench is filled with termite product, the product seeps into the ground, then the trench is backfilled with treated soil.